Rucking is so last month, but it was such a popular series that we’ve decided to make it a permanent addition to The Rise’s evening repertoire. And last Tuesday we held our first Rise-style rucking workout! We took our weighted backpacks and used them to add an extra dimension to our squats and flutterkicks, and unlocked a new exercise for The Rise – bicep curls! (sorry we didn’t capture any curls on camera). There were thunderbolts and lightning (very very frightening me), but we were spared the heavy rain and got through our workout unscathed! Afterwards we headed to Loreley Beer Garden for some drinks and good eats. I know, I’m getting ahead of myself…I’m already jumping into the weekly recap! You can find all of last week’s photos here. Below is a summary of all the morning workouts we did, Monday through Friday! It was a HUMID morning. There’s nothing more satisfying than being completely drenched in sweat by 7 AM! This morning’s workout was hot and humid – as usual – but we love pointing that out every chance we get! 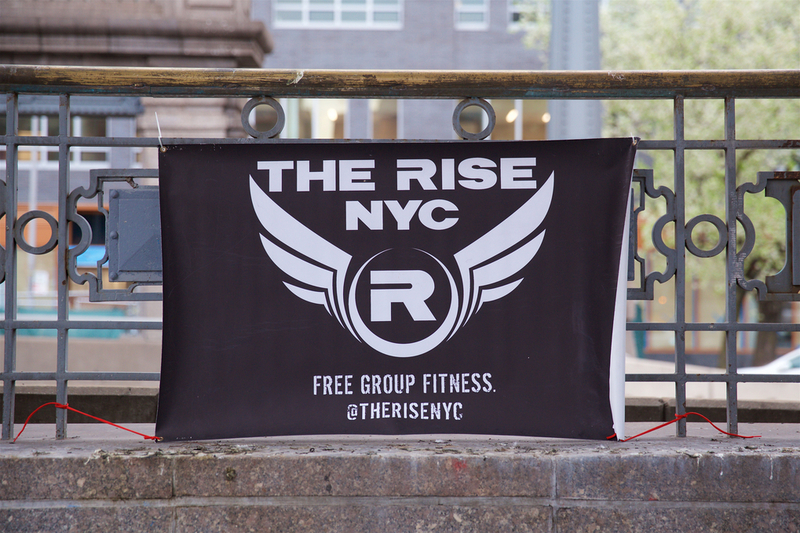 We’re out here every Tuesday at Grand Army Plaza – 6:30 AM! Tuesday’s workout was a combination of cardio, strength training, fun, high fives, two Birthdays (Jessica and Lori), lots of whipped cream, happy faces and big smiles! All that packed into 30 minutes?? Yes. Join us next time! We’re out here every Tuesday. It was a sweaty one this week! For international cat day we channeled our cat like reflexes by getting down to the floor and jumping up to the sky during exercises. We added in some deck of cards work and finished off with the daily flutter-kick challenge. Faces new and old are always popping up on Wednesdays. We want to see yours. Join us next time! Is it rain or is it sweat?! Thursday morning was fueled by high fives and high volume push-ups, because who doesn’t love a great arm pump at 6:30AM!! Thank you to everyone who came out to sweat with us, and to our newest Riser, Eric, who came out for the first time!